Fujifilm recently made the availability of its all new camera named FinePix HS10 in Indian market.The new Fujifilm FinePix HS10 Camera features a 30x optical zoom 24-720mm range lens enabling you to take wide angle to ultra telephoto images. The all new FinePix HS10 equips a 10 megapixel CMOS sensor and is capable of capturing images at 10 frames per second for up to 7 shot burst.The new camera houses a moving LCD screen and twist-barrel manual control zoom lens.FinePix HS10 features triple image stabilization control as an aid against sudden shakes. The FinePix HS10 Camera also has the capability to capture full HD 1080p movie with stereo sound facility.The camera also helps in capturing ultra slow motion video with 1000 frames per second.The camera also includes a mini HDMI output for external HD display connection. 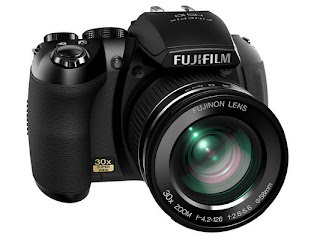 Another interesting feature that comes with Fujifilm FinePix HS10 Camera is the Motion Remover Mode facility that helps to remove moving objects from the image.With the help of Motion Remover Mode its possible to take five images in quick succession and can be combine to a single image with all moving objects removed. Fujifilm FinePix HS10 Camera is designed for photographers seeking SLR level at lower cost.The all new Fujifilm FinePix HS10 Camera now available in Indian market with a price tag of Rs. 27,999. Tags:-Fujifilm FinePix HS10 Camera features, Fujifilm FinePix HS10 Camera india price, Fujifilm FinePix HS10 Camera specifications, Fujifilm FinePix HS10 Camera price details, Fujifilm FinePix HS10 Camera india availability.